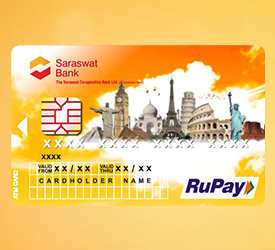 RuPay Classic International Debit Card - Saraswat Cooperative Bank Ltd.
Saraswat Co-operative Bank Limited is the 1st bank in the co-operative sector to launch new RuPay Classic International Debit Card. A prominent feature of this card is the chip embedded in it. The chip will ensure safe and secure card usage. This card can be used at any ATM and Merchant Establishment, displaying RuPay logo and internationally at ATM and Merchant Establishment displaying Discover, Diner’s Club International and Pulse Logo. The daily transaction limit is Rs 50,000/- which includes Cash Withdrawal at ATM and POS transactions. The maximum limit for cash withdrawal at ATM in a day is Rs 25,000/-. Maximum withdrawal from Other Bank ATM is Rs 10,000/- per transaction with an overall limit of Rs 50,000/- per day.